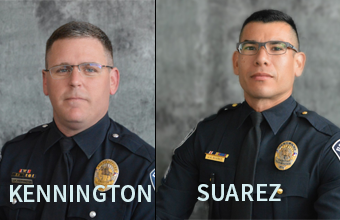 SEGUIN, Texas – Police Chief Kevin Kelso is pleased to announce the recent promotions of Sergeant Jaime "Rusty" Suarez to the rank of Lieutenant and Police Officer Joshua Kennington to the rank of Sergeant. Lieutenant Jaime "Rusty " Suarez began his career with the Seguin Police Department in February 2007. He received his Master Peace Officer License through TCOLE and holds a Master’s Degree from Texas State University. His leadership roles began to develop as he took part as a Field Training Officer, K-9 Officer, and SWAT Operator. Suarez is currently assigned to the Criminal Investigation Division, but will be re-assigned to the Patrol Division. Sergeant Joshua Kennington began his career with the Seguin Police Department in 2011 and has spent time in the patrol department and as a K-9 officer. He served in the United States Navy and received his Associates degree from the University of Maryland. Kennington is currently assigned to the Patrol Division, but will be re-assigned to a patrol shift as the supervisor. The SPD promotion ceremony will take place on 03/10/17 at 3:00 pm at the Seguin Police Department Training Room, located at 350 N. Guadalupe St, Seguin, Texas.